JCPenney said it will sell 84 million shares of stock in a secondary offering. The retailer said it would use the proceeds for general corporate purposes. Penney shares fell 15 percent on Wednesday after Goldman Sachs said it expects the retailer’s sales to improve more slowly than expected. 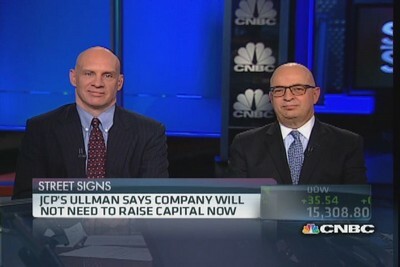 The stock rebounded slightly Thursday. The cost for insurance against a J.C. Penney default has shot back to near record-high levels over the last week. Fannie Mae, based in Washington, says Mayopoulos, 53, will become president and chief executive on June 18. He replaces Michael J. Williams, who announced in January that he would step down after a successor was found. The government rescued Fannie and smaller sibling Freddie Mac in September 2008 after the two companies absorbed huge losses on risky mortgages that threatened to topple them. Since then, a federal regulator has controlled the two companies’ financial decisions. So far, Fannie and Freddie have cost taxpayers about $170 billion — the largest bailout of the financial crisis. It could cost roughly $260 billion more to support the companies through 2014, after subtracting dividend payments, according to the government. Mayopoulos will be the third CEO of Fannie Mae since the government takeover. Williams oversaw the restructuring of Fannie’s foreclosure-prevention efforts and managed the troubled company’s reorganization. In his executive roles, Mayopoulos has managed Fannie’s human resources policies, communications and marketing, and government relations, the company said Tuesday. Spain’s economic problems are deepening, pushing the country closer to an international bailout that U.S. and European officials worry could destabilize the global economy. The risk that the euro zone’s fourth-largest country may need a massive dose of outside help is forcing the region’s leaders to accelerate weighty decisions they had expected to consider over time. These include deciding whether the euro-zone countries should begin issuing bonds that they all jointly back, a step that would be aimed at reassuring investors skittish about lending money to troubled governments such as Spain’s. 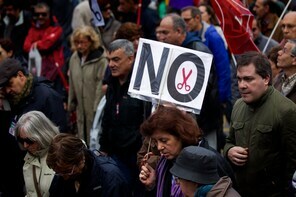 Spain hit with second recession in three years: Spain announced April 30 that it has officially entered a recession. The news comes just three days after the country said that its unemployment rate has spiked to almost 25 percent and a day after tens of thousands of protesters rallied against cuts in health care and education. 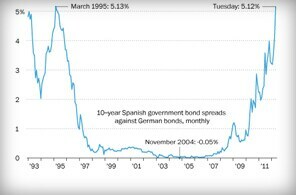 Spain’s borrowing costs are increasing. But extended debate may fast become a luxury as economic activity in Spain slows, the cost of a banking-sector rescue rises and the euro zone’s uncertain future scares off investors.